Sometimes, it's the little things in life that separate good service from amazing service. Have you ever checked into a hotel and valet parked your car? The two pieces of information usually requested from the valet attendant are your name and whether you are checking in or not. How impressed would you be if each time you retrieved your car from valet the attendant greeted you by name? At a recent overnight stay in Washington DC, the valet attendant at the Liaison Hotel did just that, referring to me by name. I was impressed. 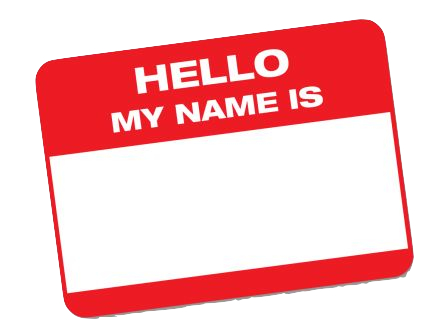 During the course of your day, take notice how many sales clerks, attendants and employees at local stores wear name tags (Starbucks, Dunkin Donuts, Panera, Subway, Wegmans, Home Depot -- just to name a few). They do it to get a bit more personal with you. However, most people simply ignore the tag; what a shame. Here's your opportunity to impress them. Call them by name, not just once, but twice. Two things will happen for sure. One, you will get a smile and two, you will make them feel good. If you are like me, I love to make people feel good. As humans, we are creatures of habit. We tend to visit the same places over and over again. Although I love to eat lunch at Subway, I will go out of my way to visit the same Subway. Why? One reason, because Sarjit at "my" Subway knows my name and I know his. We have a rapport that started by name calling. After a few visits to Sarjit's Subway, I re-introduced myself to him, and told him my name. Sarjit, has a solid customer in me, and I feel good about our relationship. So how can name calling be helpful in your business? Learning names is a simple yet effective way to build a bond between you and your prospects and customers. During the early phase of building relationships calling a prospective customer by name strengthens the thread and makes it more of a rope. Eventually that rope becomes thicker, as your prospect, now your customer, becomes a trusted source of business for your company. And to think, it all started with name calling.